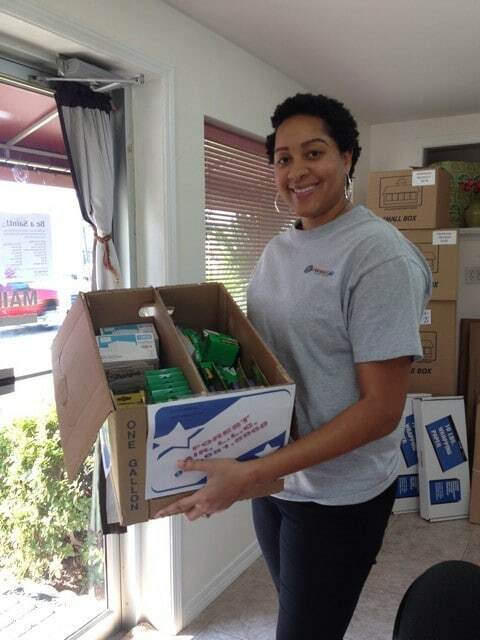 Forest Air, LLC employee Leslie Forest stops by “A Storage Inn” to donate supplies. An early morning fire at East St. John Elementary School on Friday August 14, 2015, caused severe damage to the school which may have to be demolished completely due to the extent of the damage. Besides forcing students out of classes for the next few weeks, it also created a huge need for supplies for both the students and the teachers of both East St. John Elementary School and Lake Pontchartrain Elementary which was also holding classes on the campus. As members of the River Region Chamber Of Commerce, Forest Air, LLC answered the call and recently donated a number of supplies to help the students and teachers affected by the fire get back on track. Forest Air, LLC CEO Kenneth Forest felt it was extremely important to help out saying that “the children are our future and we’ve got to do everything we can to make sure they have whatever they need to be successful in life and that starts with getting a good education”. Mr. Forest will also be making a monetary donation to the school through his church Destiny Christian Center. The Chamber has joined with St. John Parish Economic Development and St. John Business Association to help these teachers get back on track for the new school year.